The Clearfield Junior High Wrestling team participated in the Joe Iagnemma Tournament at South Fayette High School this past weekend. The team placed 7th out of 28 teams with seven individual place winners. 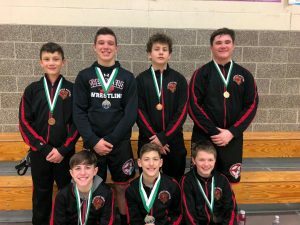 Place winners are pictured: front, L to R: Evan Davis (4th/85lbs), Will Domico (2nd/100lbs), Ty Aveni (6th/110lbs); back, L to R: Wyatt Reorda (6th/122lbs), Hayden Kovalick (2nd/165lbs), Conner McCracken (6th/185lbs), and Josh Steele (4th/250lbs). Complete tourney results can be found by clicking here. The Bison will be back in dual meet action this week with Huntingdon set to visit Tuesday and then travelling to Punxsutawney on Thursday. They will then host the Square One Junior High Tournament on Saturday, December 29.